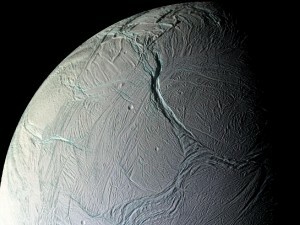 Enceladus – Liquid water evidence? NASA’s Cassini spacecraft may have found evidence of liquid water reservoirs that erupt in Yellowstone-like geysers on Saturn’s moon Enceladus. The rare occurrence of liquid water so near the surface raises many new questions about this mysterious moon. 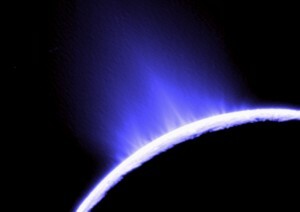 Icy fountains shoot out of Saturn’s moon Enceladus. High-resolution Cassini images show icy jets and towering plumes ejecting huge quantities of particles at high speed. Scientists examined several models to explain the process. They ruled out the idea the particles are produced or blown off the moon’s surface by vapor created when warm water ice converts to a gas. Instead, scientists have found evidence for a much more exciting possibility. The jets might be erupting from near-surface pockets of liquid water above 0 degrees Celsius (32 degrees Fahrenheit), like cold versions of the Old Faithful geyser in Yellowstone: illustration. “We previously knew of at most three places where active volcanism exists: Jupiter’s moon Io, Earth, and possibly Neptune’s moon Triton. Cassini changed all that, making Enceladus the latest member of this very exclusive club, and one of the most exciting places in the solar system,” said John Spencer, Cassini scientist, Southwest Research Institute, Boulder.